On the first day of synod proceedings, Cardinal Vincent gave an overview of the synod and some of the themes that emerged from the day’s presentations. 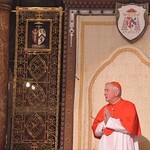 As the Cardinal explains, the group heard from individual bishops who explained their concerns and hopes for the synod. There seemed to be ‘a real desire in this synod to explore some of the great pastoral challenges that face the Church with regard to the family’. Among these challenges are the pain and difficulty that is faced by families, which can take many forms, including poverty, enslavement of women and children, and domestic violence. In these difficulties, the Church was called upon to be ‘a friend of the family’, looking to ‘create the welcome that one friend gives to another, especially to families that are in difficulty’. An important theme that emerged on the first day was the challenge of how the Church, in its writing and teaching, can find a language that people will understand. For example, the Church speaks of the ‘indissolubility of marriage’, when perhaps a more down-to-earth way would be to speak of the ‘faithfulness between a husband and wife’. Cardinal Vincent noted that this simpler language would highlight that an objective word like indissolubility has ‘a very human face to it, which as a synod we need to recognise and respond to’. The Cardinal noted the bishops clearly came feeling and bearing all that they had heard over the last year, and wanting it to be expressed at the synod. Cardinal Vincent, along with Bishop Peter Doyle of Northampton, is representing England and Wales at the Synod on the Family.